Does your company have used or excess inventory of Cisco Aironet 3800 Series Wireless Access Points that you want to sell? If you have Used or New Excess Cisco 3800 Wireless Access Points that are surplus to your current operation, we'll buy them! We buy and sell all models of Cisco 3800 Series AP's including AIR-AP3802I-B-K9, AIR-AP3802E-B-K9 and AIR-AP3802P-B-K9 models. NetEquity.com is a leading commercial buyer of Cisco 3800 Series Wireless Access Points, as well as excess inventory of New, Used or Refurbished Aironet equipment. If you have Aironet APs or other devices you need to liquidate, contact our purchasing staff today for a fast, competitive quote to purchase your excess inventory. Cisco Aironet 3800 wireless access points provide superior performance for connected wireless devices with 802.11ac Wave 2 support. These access points feature MIMO technology (MU-MIMO), allowing for multiple data streams which can travel from the wireless access point to Wave 2-supported devices. This gives the Cisco 3800 Series access points a huge boost in performance versus earlier generation wireless access points. Endpoint client devices connect simultaneously and are able to get information faster than with traditional wireless access points. Cisco 3800 Series Aironet access points also offer Multigigabit Ethernet support, Flexible Radio Assignment and Dual 5-GHz radio support. NetEquity.com is a leading Buyer and Seller of Cisco Aironet 3800 Wireless Networking Equipment. If you are an equipment seller or potential buyer interested in pricing, we can help! Contact us today for a quote. Are you looking for a competitive quote to purchase New or Refurbished Cisco Aironet 3800 Series Wireless Access Points? We stock a wide selection of New and Professionally Refurbished Cisco Aironet wireless equipment offered with a full 1-Year Replacement Warranty. NetEquity.com offers a range of Aironet 3800 Series models in both New and Professionally Refurbished Condition including AIR-AP3802I-B-K9 and AIR-AP3802E-B-K9 models. NetEquity Refurbished Cisco Aironet 3800 Series Wireless Access Points are professionally remanufactured to Grade A Cosmetic Condition, fully tested by Certified Engineers and reset to Factory Default settings. Our Refurbished Cisco Aironet Wireless Access Points include Mounting Hardware and RJ45 patch cables, and are ready to install out of the box. In addition to offering extremely competitive pricing on Refurbished Cisco Aironet Products, we also offer a full 1-Year replacement warranty for End Users on all Refurbished Cisco products. We also maintain a very large standing inventory of the most popular Cisco Aironet Wireless models and accessories, ensuring that we have what you need IN STOCK, with no long lead times. The Aironet 3802i is the standard model variety, and has built-in antennas for applications where standard integrated radio antennas are sufficient for deployment. The Aironet 3802e variety comes with 4 external antenna connectors, which can be configured with different antenna types to create specifically shaped wireless coverage areas. The Aironet 3802p model variety, which was manufactured for use in ultra-high density user environments such as stadiums, school campuses and convention centers, with features to support such high levels of endpoint connectivity. If you are interested in upgrading from your current Cisco Aironet wireless access points, contact us today for a trade-in quote on your old equipment. We also provide competitive pricing on New, Used and Refurbished Aironet 3800 Series Wireless Access Points. NetEquity.com wants to buy your used, excess or end-of-life Cisco Aironet 3800 wireless access points. We purchased used wireless access points from companies who have upgraded their networks and want to capture some residual value from their old equipment. 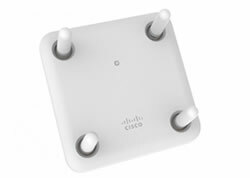 We also buy overstock/excess inventory of New and Refurbished Cisco wireless access points. We buy and sell most models of Cisco Wireless Access Points. If you've simply outgrown your Cisco 3800 access point and are interested in a trade-in or upgrade, we can help. Contact us today to sell, consign or trade your unwanted Cisco Aironet 3800 Series equipment.